Actionwork® now offers half, three-quarter or full-day creative anti-bullying programmes for Anti Bullying Week and beyond. Our award-winning programmes are supported by scientific research and can be tailored to suit the needs of schools, colleges, youth clubs, local authorities and local government all over the UK and beyond. 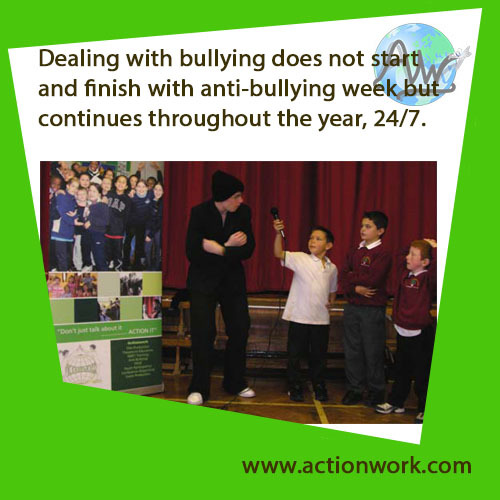 Actionwork® has over 25-years experience of dealing with bullying and cyberbulying. 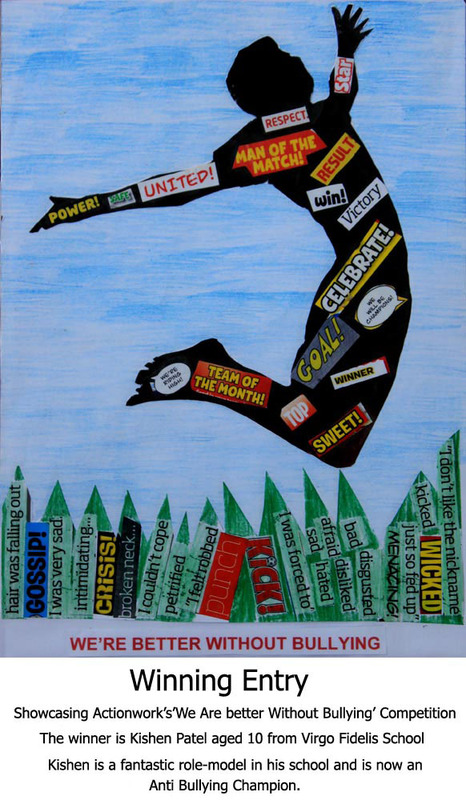 All our programmes are creative, powerful, educational, fun and inspiring. We can visit you anywhere in the UK and abroad. The ultimate in theatre-in-education. Below you can find details of shows, workshops, training and resources to support you for your own anti-bullying days and national Anti-Bullying Week. For ease of booking Actionwork® programmes can now be booked as half-day, three-quarter day of full-day packages. Packages are made up of 1) Sessions, 2) Add-ons and 3) Resource pack. Packages are delivered on the same day in the same venue and can be run morning, afternoon or evening. 6) Finally Contact Us to make a booking. Discounts available for booking multiple packages. - Introductory anti-bullying workshops for large and small groups. - All Different All Equal. - Make a noise about bullying. - The Future is Ours. Safe, Fun and Connected. Dealing with cyberbullying and youth voice. - We're better without bullying. With a focus on bullying and achievement. - Stop, think, words can hurt. Focus on verbal bullying, banter and hurtful language. - Taking action together. We all have a responsibility to deal with bullying. - Being different, belonging together. Helping people recognise and value dfference, diversity and togetherness. - Ability, disability and working with bullying and special needs. - Racism, homophobia, sexual bullying, and faith based bullying. - Your bespoke anti-bullying workshop here. About Actionwork® and the creative programmes we deliver. "We were amazed", "Our students were entertained throughout", "We want more", just some of the quotes from schools who have booked our Anti Bullying Week Workshops. The workshops are powerful, fun and exciting and include; music, science, strategies and the most up-to-date research and information on bullying possible. 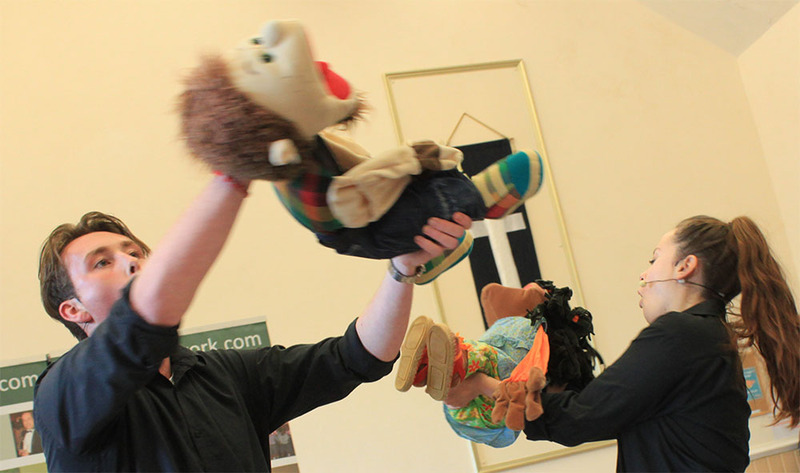 The ultimate anti-bullying week theatre in education workshops for primary schools, secondary schools and colleges. Read all about how we work and operate in schools via an independent evaulation of Actionwork® from Plymouth University. The Actionwork® Anti-Bullying workshops are high impact sessions that are positive, fun and engaging. Suitable for main stream and special schools. The Anti-Bullying Workshops provides an important focus for schools' anti-bullying campaigns, complimenting existing anti-bullying work in schools, colleges and community centres. The workshops allow schools and other groups to make a strong statement of non-tolerance towards bullying, whilst giving their students and young people the chance to explore the issues and the importance of their own role in dealing with it. The Actionwork® Anti Bullying creative programmes have won numerous awards including the 'Flame Award', 'Empowerment Kansai Award' and the 'ipoweri Award' for best practice. The workshops have been commended by numerous leading anti-bullying researchers and practitioners including those at Plymouth University, Goldsmiths College and Hua Dan. Actionwork® are core members of the Anti Bullying Alliance (ABA), the International Observatory of Violence in Schools (IOVS) and the Society for Intercultural Education, Training and Research (SIETAR). We can help make your anti-bullying day special, memorable, educational, creative and fun. Visit the Actionwork® Anti Bullying Roadshow pages. Visit the Actionwork® Anti Bullying Workshop pages. Visit the Actionwork® Workshops main page.